Could Egypt’s experience of Internet activism leading to revolution serve as a model for social movements everywhere? That seems to be one of the take-aways of David Faris’s book Dissent and Revolution in a Digital Age: Social Media, Blogging and Activism in Egypt which offers a detailed case study of Egyptian media activism from 2005 to 2011, and draws from it a general model for what works and what doesn’t. While the author argues for the importance of local contexts and situations in setting the stage for digitally mediated resistance to the Egyptian regime, he also makes much larger claims about the ways digital media operate in social protest movements, and why outcomes vary from one revolutionary effort to another. The core of his argument seems to be that social media networks “can trigger informational cascades through the effects of their interaction with independent media outlets and on-the ground organizers” (p. 22). In turn, these informational cascades “can make it difficult for regimes to maintain their control of information hegemony” and can stimulate collective action “by lowering the ‘revolutionary thresholds’ of individuals embedded in social networks” (p. 22). “Informational cascade” refers to the collective messages, values and knowledge about revolutionary activities created through on-line activism, and which can produce rapid shifts toward peoples’ tipping points. Faris’s contribution to this revolutionary threshold model is that social media networks alter participants’ situations by affecting the speed and scope of the diffusion information and ideas, and thus produce the informational cascades that increase the likelihood that thresholds will be met. by providing organizing frameworks for organization and coordination of real (as opposed to virtual) political engagement. The Green Revolution in Iran (2009–2010). Unsurprisingly, Faris concludes that the his model works across all these revolutions, albeit he acknowledges that different revolutions had different outcomes because of particular contextual factors, viz., the specific roles played by local and international political institutions. I’m never thrilled with models that derive from homo economicus constructions of human action. That said, there’s a lot to like in Faris’s book. First, by beginning in 2006 it offers a longitudinal study that recognizes some of the historical depth behind the seemingly sudden revolution. It’s based on the work he did for his 2010 dissertation, Revolutions Without Revolutionaries: Social Media Networks and Regime Response in Egypt, many of the ideas for which are rehearsed in an article entitled “Revolutions Without Revolutionaries? Network Theory, Facebook, and the Egyptian Blogosphere” in Arab Media & Society. Second, it is based on a genuine knowledge of Egypt, rooted in an experience-based knowledge of Cairo and detailed interviews with journalists, activists and bloggers as well as analysis of Egyptian media. Third, the comparison of social media use between the Egyptian revolution and revolutionary activities in Eastern Europe, Africa and Persia is useful for those broadly interested in the roles of social media in social change. Coming back to Faris’s optimism about the revolutionary potential of digital activism, I’d say there was a clearer test case: can Egypt’s cyber revolutionaries do it again? Because the revolution has not yet produced any of the key elements which the revolutionaries sought, with the exception of Mubarak’s resignation. No improved economy, no enhanced freedom, no social justice. David Faris is an Assistant Professor of Political Science at Roosevelt University where he teaches Egyptian and Middle Eastern Politics. Faris also has a readable, and navigable lecture about the Egyptian revolution in Prezi. Faris, David. 2013. 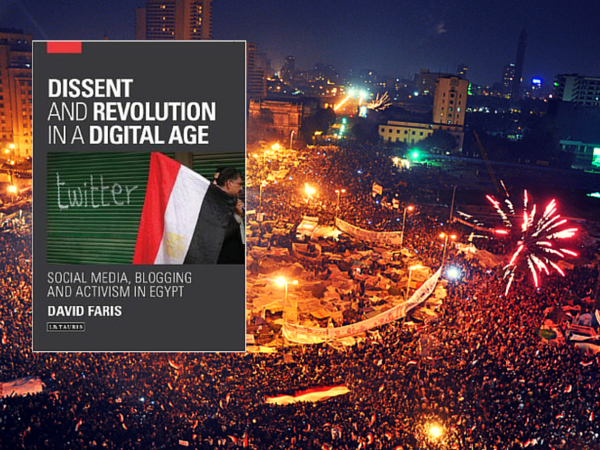 Dissent and Revolution in a Digital Age: Social Media, Blogging and Activism in Egypt. I.B. Tauris: London. Faris, David. 2008. Revolutions Without Revolutionaries? Network Theory, Facebook, and the Egyptian Blogosphere. Arab Media & Society 6.